From Santa Claus visits to Christmas concerts to fat bike races, there’s a lot going on in the Badlands this month. You’ll lose your mind if you try to remember it all. The good news is, you can keep your mind, just know where to quickly access the calendar of events. So, here are two tips. Bookmark the Beautiful Badlands ND Things to Do page. It has a continually updated calendar of events so you don’t have to try to remember them all. Download the free resource of 10 local calendars that will help you zero in on the region where you want to know about events. It’s not as tough as it used to be. By-passes have been built around many towns where traffic congestion was a problem. New Town, Watford City, Williston, Alexander, Killdeer, and Dickinson have traffic diverting by-passes to help relieve the traffic tie-ups. Yes, there are trucks on many of the highway, but not nearly as many as there were 5 or 10 years ago. You’ll find greater congestion in Bismarck or Fargo. Williston is doing a good job of redirecting traffic through the city. So, pay attention. Since then, many highways have been improved with passing lanes, turn lanes and better surfaces. Tip: The routes you took into town or in town are different than they were a few years ago. So, watch for signs, and use the most up-to-date road apps. Always check the North Dakota Travel Information Map for the latest conditions. Here’s the link. It might be getting late for this, but you can still use some fast services to turn your Badlands photos into Christmas cards. Badlands backdrops make impressive Christmas cards. We went out to the Wind Canyon overlook for our Christmas cards. Badlands backdrop for Christmas cards. Yes, it’s getting late in the season, but here’s an idea — Christmas postcards. It’s not too late to take a photo of you and your family and then have the card reproduced as a postcard. We have a public presentation we give on getting your best photos from the Badlands. Here’s an article that gives you some tips for getting the best Badlands photo. Both the rotunda and the gift shop at the Missouri Yellowstone Confluence Center include gift items in shopping experiences that avoid the hustle and bustle. Did you know the gift shops at Fort Union and the Missouri Yellowstone Confluence Interpretive Center have gift ideas that you will not find elsewhere? There is also pottery and jewelry and books at the Mondak Heritage Center in Sidney. There is pottery at Prairie Fire Pottery in Beach a world-famous, high-class pottery store. The best part is it’s not elbow-to-elbow crunch at the gift shops. You’ll be surprised and encouraged at what you find there. Okay, true confession. Guilty! We shop at our own online stores and we think you’ll love what you see there. This is a popular place for Badlands wall art, canvas wraps, and prints as small as 5×7 inches or 3-feet by 4 feet large. You can also get Badlands images as phone cases, refrigerator magnets, Christmas ornaments, desk organizers, mouse pads. One of the most iconic scenes in North Dakota is found in the north unit of Theodore Roosevelt National Park, south of Watford City, North Dakota. The stone shelter overlooking the Little Missouri River is a classic structure built by the Civilian Conservation Corps in 1937. What’s ahead? 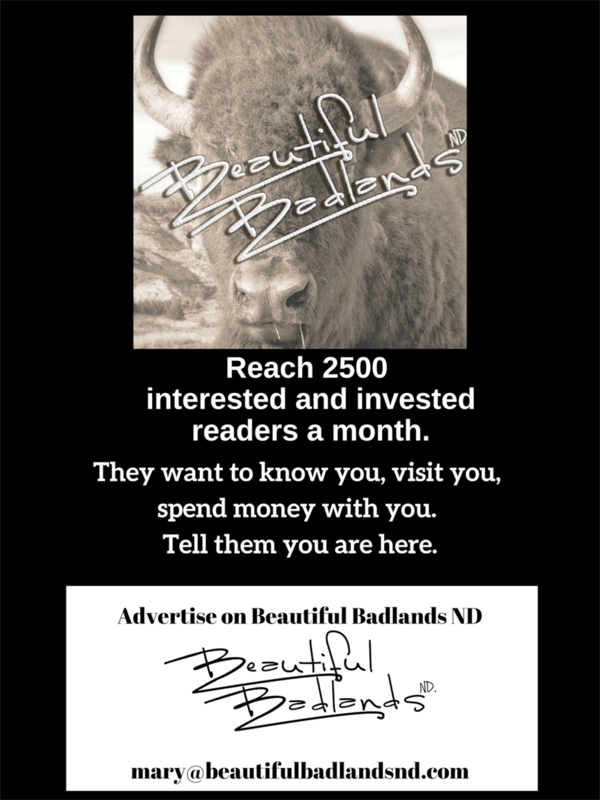 Beautiful Badlands ND is building an online store of Western North Dakota products that will be active in 2019. One thing the North Dakota Badlands has going for itself that you won’t find elsewhere is stunning landscape and accessible trails. So, make a memory. Bundle up the family and wander out to one of the easy winter wonderland trails. There are few things that can produce a rush of feel-good endorphins like a 20-minute walk in the cool fresh air. There are even little hills (and big hills) where you can let your kids slide. We have cross-country skied the Badlands trails. A cross-country skier navigates the Long X trail on a two to five-mile loop. What a memory you will create with a bit of fresh air. Plus: You’ll de-stress, unwind and relax. You need that before you dive into the rest of the joyous stress this time of year. Here’s one example, an easy drive then a short quarter-mile hike to bring you to this view of Devils Pass. Don’t want to walk the trails? At least take a drive. Both the North and South Units have paved roads to drive. Or if you are a bit adventurous, drive north from Camels Hump to the historic Elkhorn Ranch. The drive is spell-binding. Theodore Roosevelt’s Elkhorn Ranch Site will give you what you need to unpack your holiday stresses — if you’re willing to do it. Pick another destination on a gravel road such as West River Road or East River Road at Medora. Be amazed at the sugar-coated hills after it snows. Sugar-coated hills reward visitors with a sight that is unlike the rest of the year…one that few people see. But really, the best idea: get out and walk a bit, even if you just walk down a gravel road in the Badlands. Do you have other ideas for shopping, or de-stressing, or how to handle the holidays Badlands style? We’d love to hear from you. Just comment below. Or leave a comment on our Facebook page.